Over the last few years we have spoken to timeshare customers across the country to obtain feedback and information on their timeshare experiences, and the destinations on their popular lists. Resort locations that often come up are in Goa, Ooty, Munnar, Kodaikanal, Mussoorie, Darjeeling and Manali – among other popular go-to places. And here’s what we want people to know: India’s organized timeshare network under the AIRDA banner has other interesting destinations that are still relatively unknown, and waiting to be discovered. Q: Do you go to the same resort location every year? Sometimes, when you’re planning that annual vacation, it seems simpler to go to locations that you are familiar with - you know the location, the resort, the people. There’s a comfort level in all things that are familiar. But at a newer resort location you might discover a whole new experience - peace, quiet and freedom from crowds. Timeshare companies also feel the need to be present in newer geographies to give customers more holiday options. Newer locations can boost jobs and opportunities around new resorts, and can ease the load on other high traffic resorts. Q: Do you want to know about unexplored destinations? A: If you are one of those vacation seekers looking for newer horizons, watch this space. We plan to feature timeshare locations off the beaten track, where AIRDA members have a quiet but significant presence. This month we look at Jodhpur – a city that topped Lonely Planet's list of most extraordinary places to stay in 2013. Q: Have you thought of Jodhpur as a holiday destination? A: Jodhpur is a tourist destination that has the right mix of vacation and tourist interests - palaces, forts, monuments and temples – and these are interesting visual highlights across the bare canvas of the Thar Desert. Jodhpur earns its Sun City tag for the bright and sunny weather you can experience right through the year. Jodhpur is also known as the Blue City because of its unique cityscape – wide stretches of houses painted blue – especially around Mehrangarh Fort. Over the years Jodhpur, like most other bustling cities in the country, has grown beyond its perimeters – the old wall showing us how much further it has grown. Q: What are the main attractions in Jodhpur? A: Jodhpur has a storybook history and is linked to the Gurjara-Pratihara Empire. Jodhpur was founded in 1459 by Rao Jodha, a Rajput chief of the Rathore clan. Over the years, Jodha’s territory grew large enough to be made into a state known as Marwar. Mehrangarh Fort : This fort is strategically perched on a hill that rises up150 metres. This is one of the largest forts in the country and still managed by the Maharaja of Jodhpur. The Mehrangarh Fort houses a museum displaying antiques, ornaments and weaponry. Jaswant Thada : Popularly known as the Taj Mahal of Marwar, this monument of white-marble art was built in 1899 - in memory of Maharaja Jaswant Singh II. Umaid Bhawan Palace : This magnificent palace is often featured among the finest palaces in the country. The 347-room work of architectural excellence was built by Maharaja Umaid Singh. This palace is part museum and part luxury hotel. Clock Tower & Market Area : The Clock Tower is a popular landmark and city highlight – the market area nearby is known for its popular shopping locations. A good example here is Sadar Bazaar for exquisite fabrics, handicrafts and silver collectibles. Mandore Garden : This popular public garden takes you back in time in more ways than one – with famous temples and monuments of erstwhile rulers. Umaid Public Garden : This public garden has a museum displaying armory, textile, local handicrafts and miniature paintings. Rohet Garh is a heritage location, 40 kms from Jodhpur. Osian is a center of Jain temples and other old monuments, and 85 kms away from Jodhpur. The scenic Guda Lake is 25 km from Jodhpur – it is a picturesque stop over for bird lovers. The 13th century Balsamand Palace is located on the banks of Balsamand lake, just 5 km from Jodhpur. Sardar Samand Palace is just 55 kms away from Jodhpur, and was built in 1933 by the Maharaja of Jodhpur Umaid Singh. The palace is a heritage resort on the banks of Sararsamand lake. Q: Is there an AIRDA resort in Jodhpur? Image courtesy DesertScape Resort JodhpurA: DesertScape Resort Jodhpur is located 15 km from the city center of Jodhpur on the Pali National Highway which is an upcoming area of Jodhpur. This AIRDA network resort offers a mix of comfort and modern amenities in various room formats - family suites, deluxe and standard rooms. Customer convenience features include a multi-ethnic restaurant, ayurveda massage centers, spa with steam & sauna facilities and a club house close to the resort – with facilities for gym and indoor games, and a swimming pool. All rooms have individual controls for air conditioning, and come with useful convenience features - LCD TV, cable and satellite channels, 24 hours hot/cold water, tea/coffee maker, a mini bar and comfortable bathrooms. Guests at the resort have the convenience of tour/ticket/travel assistance, secretarial services and access to an efficient business centre. 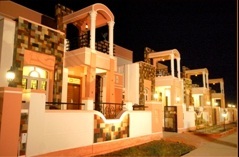 The resort also offers services for executive retreats and plays host to destination weddings. There’s more information on DesertScape Resort Jodhpur at this link. E&OE - Please Note: The information featured here on Jodhpur is from internet sources – please cross check locations, distances and other details.